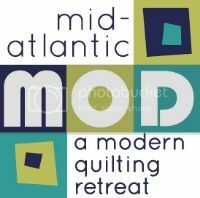 Philadelphia Modern Quilt Guild: Member Spotlight on... Candi Weinrick! I was with some friends in a cross-stitch store and we heard a lady talking about a quilting store on the other side of the building. We pretty much ran right over there and made it well known that we were excited to have found the store. I took a beginner class. I still have the first quilt. Well top. Its never been quilted because its hideous. What attracts you to Modern quilting? Im not really sure. I don't consider my style of quilting to be modern. I love traditional patterns with modern fabrics. The best part is when a finished quilt comes out of the dryer all crinkly and warm. What is the hardest thing about quilting? cutting. ugh. Where do you do your work? Do you have a quilting room? (Feel free to attach photos!!) I use our 4th bedroom. I like to call it the design studio. I have a Husqvarna Viking Sapphire 850 and a Husqvarna Viking Lisa. They are workhorses! I would say about 10 hrs per week on average. I do name them although sometimes its hard to come up with a good name. I also put labels on but that just started recently. It depends on the project. My favorites are pink and green. Sigh. Where do you buy your fabrics and materials? Is there any particular supply you’re partial to? I buy most online either through Fat Quarter Shop or Pink Chalk Studios but nothing beats going into a store to manhandle the fabric. shhh - they're secret. I have a scrappy tumbler quilt that's being made using the leaders/enders idea and I have a scrappy hand pieced hexagon thats taking forever. Do you make up your designs? I knit and cross-stitch. I've tried to learn crochet but my hands do not like it! To keep quilting as long as I can! Writing my first pattern. That took so much more work that I had ever expected. I've got 2 more partially written. Hugs from my kids - they're rare and so amazing.